If you've ever been interested in vegetarian cooking, this is the place to start. Whether you end up using these recipes as full course meals or just as inspiration for amazing vegetable side dishes it's worth the time to read through it. By JoAnn Rachor. 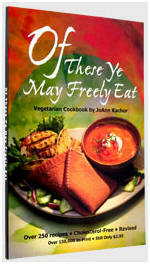 Revised 2000 - Many acclaim this to be the very best vegetarian cookbook. Over 250 recipes at an unbeatable price. Recipes are economical, low in calories, cholesterol free and delicious. Many recipes using tofu. Several pages on drying food. Nightshade free recipes for those with this food sensitivity. Not only is it a great cookbook but there so many tips and ways to easily do things (my style!) from using part of the water in the blender and then rinsing it later with the rest of the water to an extensive drying section that would be invaluable for backpackers and outdoor people. Can't wait to try some of those methods. Simple to read, the recipes are easy to make without a lot of unknown ingredients. The recipes in this book are completely free of animal products. The back of the book contain essential health information about sugars, cheese, protein and other topics. This is one of our best cookbooks! There's also a section on food drying. Suppose you've made some of the recipes in Of These Ye May Freely Eat and want to try preserving them for later eating by drying them. Well, this section tells you how to both dehydrate and rehydrate them. All for 16.99GBP. At that price you can pass them out as gifts to all your friends.